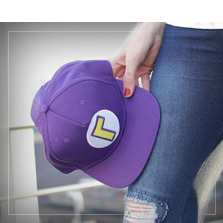 Would you like to wear the most famous red cap in videogames? You’ll find it in this collection of Mario Bros merchandise. 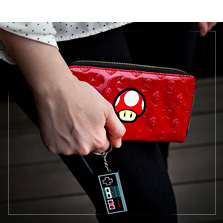 Besides these different colored caps, you’ll find unique Super Mario Bros gifts like wallets, pendants, keyrings, socks, backpacks and even rings! 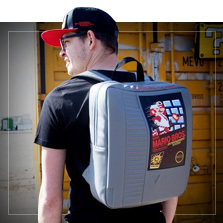 Add to this fun collection of gifts a variety of t-shirts, hoodies and Mario Bros clothing. Find different prints featuring Mario, Luigi, Yoshi or Toad, Princess Peach, and even Mario’s favorite stars. Is all you can think about the Mushroom Kingdom? 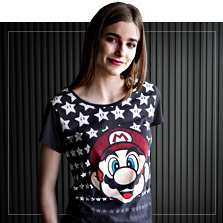 Discover Mario Bros merchandise and surprise yourself with all of the clothing, accessories and gifts you’ll be able to order for yourself and your friends. Mario Bros Merchandise is amazing! Are you looking for the perfect gift for a special geeky friend? If he or she loves videogames and breezes through all of the levels, you’ve come to the right place. You’re sure to get it right with these Mario Bros gifts. Hoodies, t-shirts, pyjamas, backpacks, caps, wallets, mugs, socks, lamps…the choices are endless! You’ll also find necklaces, pendants, rings, wallets and keyrings. Mario Bros merchandise offers a wide collection so you can treat yourself or surprise a friend with an original and fun gift.